Does Your Water Look Funny? 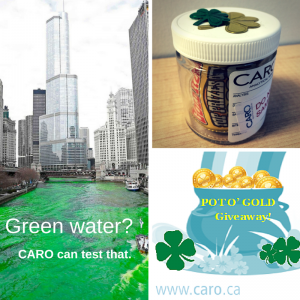 Just in time for St. Patrick’s day: CARO’s Laboratory Leprechaun has been at it again, hiding his pots of gold in CARO Coolers where our clients are sure to find them. Place a bottle order today, and you could make away with a portion of his booty! Another Leprechaun will soon be making his way to Chicago to play a prank that has been a tradition in the city for generations – by dying the river green! What causes the green colour? A long long time ago (in the 1960s), the city was struggling with waste discharge into the Chicago River. In order to put a stop to the contamination of this important waterway, city officials began a sting to identify the guilty parties and hold them accountable for their polluting ways. In order to assess the source of the discharge, oil-based Fluorescein dye was mobilized through discharge streams to visually identify the origin of the dumping. This proved effective and pollution decreased in the river. One creative “Leprechaun” decided to use this dye to celebrate St. Patrick’s Day by turning the entire River green once a year, and so the tradition began! Over the years, environmental concerns led to the substitution of Fluorescein for something else. What was it? No one knows, as it is a closely guarded secret, but the public has been assured that is environmentally safe. Interestingly, the dye used is actually an orange solid before it makes contact with the water. From that information alone it reveals that it is likely to be a copper, chromium or iron compound. Why? Some of those types of compounds, when combined with water, produce different coloured compounds. For example, when you see a green/blue scaling by your faucets or drains, it is likely from copper pipes leaching copper and forming complexes with compounds in your water, usually salts. Fast-forward to 2016, and although the St. Patrick’s day tradition holds strong in Chicago, the environmental industry has progressed in terms of discharge detection. CARO offers a number of packages to detect the presence of low level (PPT) Pharmaceutical and Personal Care Products (PPCPs), which can be indicative of a breach or failure in Waste Water systems. Some PPCPs are broken down in the environment, but many end up in soil and water bodies and the impact of these pollutants on Human Health are still being studied. We also test for all the possible metals that may be contaminants of concern, bacteria and many more parameters. You can find out some more information on our water testing capabilities here if you like. For more information, please contact your local CARO Laboratory!